Kilimanjaro runs a series of MYOB Exo User Group Forums twice a year. This gives MYOB Exo users the opportunity to hear about updated business trends, technologies and new MYOB features and updates. The User Group provides quality time where the Kilimanjaro tribe can share best practices in order to help our clients improve their efficiencies using technology. 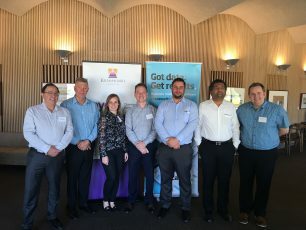 The latest MYOB Exo User Group Forums ran through February and March. This was exciting for us as we extended the forum to five locations through Australia and New Zealand. It was great to be able to meet and engage with over 100 Exo Users across Sydney, Melbourne, Canberra, Perth and Auckland. Our goal is to provide our clients with valuable content that includes innovative and inspiring ideas integrated with current trends and technology. The theme this year was ‘Business Transformation and Metrics that Matter’. Our observation across our client base is that with new developments in software, real-time information across every organisation is now a reality. We spoke about the economy, business transformation and the importance of incremental improvement. We also spoke about Digital Transformation. We defined this as aligning people, processes and technology with the businesses strategy and vision. Kilimanjaro’s role is to assist businesses in the application of digital capabilities (technology) to processes, products, and assets. The overall goal is to improve efficiency, enhance customer value, manage risk, and look for new or better ways to make money. To create an informative and inspiring Forums, we always look for specialists that we feel can benefit our clients and their businesses. This February / March, our clients had the opportunity to hear from our trusted partners, NETSTOCK and Phocas. Both speakers shared insights into their specialities and discussed the essential need-to-know tips that will improve businesses growth and efficiency. Andy from NETSTOCK examined inventory and supply chain management while Craig from Phocas demonstrated how to use data to identify opportunities, grow profits and improve efficiencies. Transforming your business is something all companies need to do. If you don’t know where to start, read our article on “How to transform your business”. Sydney and Melbourne’s forums also featured special guests from NAB, Ivan Colhoun and David de garis, who both shared their economic view for 2018. Thank you for coming and See you next time! We want to thank all Exo Users who attended our MYOB Exo User Group Forums in the past. We find it to be an excellent way for us to engage with our clients on a regular basis. We are always happy to hear genuine feedback about the products and our services and we are glad we can contribute in some small way to your own success. through these forums. Our next MYOB Exo User Group Forums will be held in the second half of the year, so keep your eyes open for our newsletters and registration details. This is an opportunity not to be missed for businesses wanting to learn, engage, grow and succeed.